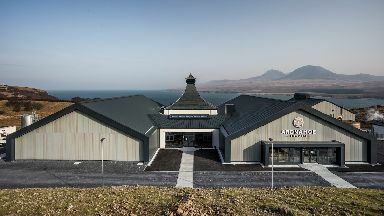 Ardnahoe Distillery, on the island's north-east coast, has been built with a £12m investment from family firm Hunter Laing & Company. Managing director Stewart Laing said: "Since working as a teenager at Bruichladdich Distillery over 50 years ago, I have had a huge affinity with Islay and its malt whiskies. "When we decided to build our own distillery, there was only one possible location. 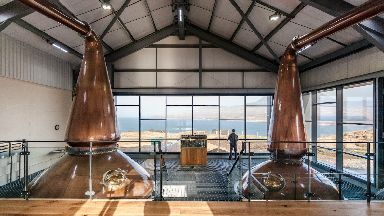 "We have built a great team to manage the distillery and run the visitor centre and in a few years' time we will be able to drink a great whisky in the classic Islay style, staying true to the island's heritage with a heavily peated malt." Andrew Laing, export director, said: "We wanted the visitor experience to be at the heart of Ardnahoe. "Our family business values and our distillery team, most of whom are islanders and steeped in the whisky industry, offer a warm Islay welcome to all who want to be part of the Ardnahoe journey."